Zoltán Székely was born on December 8, 1903 in Kocs, Hungary. His father, Laszló Székely, was a physician, and because of his work the family moved from time to time. At home there was music every day: Zoltán’s father played the violin, his mother Erzsébet sang and his sister Piroska played the piano. Lászlo Székely was not familiar with classical music but played the folk music of the Hungarian countryside. He was an avid fan of gypsy music and already during his student days in Budapest he was befriended with several gypsy violinists. As a boy, Zoltán was fascinated by his father's violin playing and started playing himself at the age of almost nine. The family, recognizing his exceptional talent, moved to Budapest two years later and the musically gifted young boy enrolled at the prestigious Franz Liszt Academy of Music. He studied violin with Jenő Hubay, chamber music with Leó Weiner and composition with Zoltán Kodály. In June 1921, he obtained his diplomas, highly praised for his “classical tone” and his pure, unsentimental and powerful, yet warm musicianship. A flourishing career along the world’s most famous concert halls was predicted by the critics. Székely's acquaintance with Béla Bartók, arranged by Kodály in March 1921 was of immense importance. Kodály, a good friend of Bartók, advised Székely to bring his own work to the meeting. Bartók was twenty years older than Székely and already a famous composer and pianist. Consequently, a considerable difference in both age as well as in status existed. Székely showed Bartók his solo sonata written a year earlier. Bartók was very much impressed by Székely and already the following month, in April 1921, they gave two concerts together. It was the beginning of a fruitful collaboration lasting almost twenty years, with many performances, also in the Netherlands. Their friendship is nicely illustrated by the fact that Bartók dedicated two major compositions to Székely: his Second Rhapsody (1928) and what would become the world famous Second Violin Concerto (1937-1938). Székely obviously premiered both works. The premiere performance of the Violin Concerto on March 23, 1939 with the Concertgebouw Orchestra Amsterdam conducted by Willem Mengelberg was a historic feat. A recording of this concert still exists. After World War I, the possibilities for the young musician in Hungary were limited and Székely emigrated to the Netherlands. He was provided accommodation in Nijmegen by the well to do Everts family. For several years he traveled from Nijmegen to concerts in the Netherlands and abroad. In the Nijmegen concert hall De Vereeniging, he made his debut in November 1922 with the Arnhem Orchestral Society under the direction of Martin Spanjaard. The program included Variations sur un thème hongrois by Székely’s teacher Jenő Hubay, and Dvořák's Violin Concerto. Székely worked with this orchestra until 1941 as a soloist in violin concertos by D'Ambrosio, Brahms, Glazunov, Beethoven, Viotti and Ravel (Tzigane). In December 1922, he auditioned in Amsterdam and the young violinist made an excellent impression on Willem Mengelberg who wrote the following testimonial: “Herr Székely gehört zweifellos zu den besten der jungen Geigen Künstler u. ich kann ihn jeder Concertdirection als Solisten wärmstens empfehlen.” (Mr. Székely is, without a doubt, one of the best young violinists and I can highly recommend him as a soloist to any concert organizer/management). As of 1926, Székely was the soloist in various violin concertos with Mengelberg’s Concertgebouw Orchestra. Obviously most often in Bartók's Violin Concerto, which was especially written for Székely: he performed this concerto ten times with the orchestra. In 1926, Székely married Mientje Everts, his admirer from the start, and they moved to Santpoort near Amsterdam in 1935. The architect Gerrit Rietveld had designed their new home and it was named The Rhapsody, referring to Bartók's composition for Székely. In January 1935 Bartók and his wife were the first guests in their new home. On September19, 1938, Mientje and Zoltán’s son Frans was born in this house. In 1935, a new string quartet was founded in Budapest by four ambitious conservatory students. To avoid confusion with the Waldbauer-Kerpely string quartet, known outside Hungary as the Hungarian String Quartet, it was initially called the New Hungarian String Quartet. 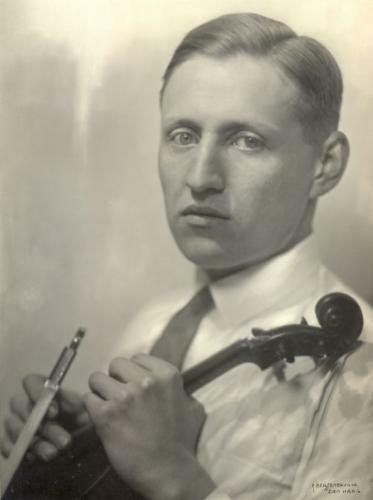 Székely befriended the quartet and in 1937, they asked him to join them as first violinist. With his expertise, experience and not in the least his fame, the quartet hoped for a significant boost. Székely accepted under the precondition that the quartet would be based in the Netherlands. The Hungarians agreed and moved to the Netherlands. Now Székely followed a new course, because it meant the end of his solo career. It was a wise decision: after Székely’s first performance as a member of the quartet in 1937 in the Amsterdam Concertgebouw they played at least fifty more concerts at that venue, and hundreds of concerts all over the world. The Dutch artist Ubbo Scheffer immortalized the Hungarian String Quartet with a beautiful sculpture located at the entrance to the Concertgebouw's Recital Hall. In 1963, the quartet was awarded the Amsterdam Concertgebouw's Silver Medal of Merit. The war years forced Székely to stop his activities, although initially it wasn't apparent. After the premiere of Bartók's new violin concerto in 1939, only slightly over a year later on April 13, 1940, Székely performed this work with the Concertgebouw Orchestra already for the eighth time. In 1940 and 1941, Székely again performed as soloist with the orchestra, and was also appointed concertmaster (alongside Ferdinand Helmann) in that season. His last concert with the orchestra during the war was on June 6, 1942 in Rotterdam, when Mozart's Symphony Concertante was performed together with Dénes Koromzay, the viola player of the New Hungarian String Quartet. At the start of his employment with the orchestra, Székely had signed a declaration of Aryan origin, but an archive investigation in April 1942 revealed his Jewish ancestry. The obligatory Aryanization of Dutch musical life meant that Székely’s career at the Concertgebouw Orchestra was over; his contract was annihilated as per September 1, 1942. It was the beginning of a period of great uncertainty. In his lifetime, my father had four different nationalities. In 1926, when he married my mother, she became an Hungarian national, even though they lived in Nijmegen. I was born in the Netherlands, but also registered in Budapest as Hungarian. Just before the war, my parents gave up their Hungarian citizenship and my mother and I became Dutch citizens. But for my father is was too late, and during the war he was stateless. His statelessness was probably the reason not to join the Concertgebouw Orchestra on their trip to Vienna. It is clear however that his leaving the orchestra was not voluntary. During the war, Székely's house was appropriated by the Germans and the family took up residence with acquaintances in Aerdenhout. The New Hungarian String Quartet rehearsed Beethoven's string quartets during this period, and in the final years of the war, these quartets were performed at house concerts. In the last three months of 1945, after the war ended, the quartet performed the complete Beethoven cycle in six concerts in the Main Hall of the Concertgebouw in Amsterdam. That same season they also played an additional four concerts in the Recital Hall with programs focusing on Bartók’s music. In the seasons 1946-1947 and 1947-1948 they again performed the Beethoven cycle. A flying start after the deadlock of those last war years! In 1950, the Hungarian String Quartet emigrated to California and traveled the world for concerts. Eventually, it became one of the most famous quartets ever, specializing in the Beethoven and Bartók quartets. Székely remained first violinist until 1972, when the quartet dissolved. Then, almost seventy years of age, he picked up his solo career again, with Bartók's rhapsodies and the Violin Concerto on the programs. He was invited to play “his” Violin Concerto in Budapest on September 26, 1977, on his last visit to Hungary. Székely still impressed with his “perfect soloistic technique, but fortunately without the fashionable heavy tone and vibrato”. The Hungarian String Quartet maintained warm contacts with the Banff Centre in the Canadian Rocky Mountains. After the breakup of the quartet, Székely continued collaborating with the Banff Centre and in 1976, Zoltán and Mientje settled permanently in Canada. As an artist-in-residence for many years, Székely actively contributed to musical life there. In 1990, Mientje died at the age of ninety-two. Zoltán survived her more than ten years and died in Banff on October 5, 2001, at the age of ninety-seven. In 1925, Székely's international career as a violinist was already gaining momentum. As a composer he was fairly unknown, but after his startling performance in Venice, he attracted more attention. The Viennese music publisher Universal Edition showed interest in his work, leading to the publication of Székely's solo sonata opus 1 in 1926. That same year another work was published: his arrangement for violin and piano of Bartok's famous piano composition, the Romanian Folk Dances. In 1927, Universal Edition published Székely's opus 2: the Duo for violin and cello entitled Polyphon et Homophon. Despite this promising start, Székely's oeuvre is limited to just eight works, mostly chamber music. His last composition, a string quartet, was written in the years 1935-1937. He entered this work to the Coolidge Competition but it was rejected. From that moment on, he abandoned composing and focused entirely on his career as a performing artist. Recognition as a composer arrived finally in 1987, when he was awarded the Bartók-Pasztóry prize for his oeuvre. Virtuoso, powerful and inquisitive: these are undoubtedly important features of his music. There is an interval of some twenty years between his first and last composition, hence it is a varied oeuvre. Székely developed enormously through the years. A brief characterization of some works: the Sonata for Solo Violin, opus 1 breathes a free and inquiring spirit, despite the traditional structure. The two outer movements are boisterous, with virtuosity and extreme differences in register. The foundation of his string quartet is a short motif of just three notes. From this simple material Székely creates a rich composition with incredible variation of moods and tonal colors, from hushed introspection to lyrical exuberance, a veiled and velvety softness in contrast to abrasive harmonies. The Allegro for violin and orchestra, with its rhapsodic nature, is very accessible. A lyrical solo part for the violin and syncopated rhythms in the accompaniment are the important features of this composition, akin to folk music. Thanks to Frank S. Everts for providing details on Zoltán Székely and to Mr. N.P.H. Steffen for providing details about the performances of the (New) Hungarian String Quartet at the Amsterdam Concertgebouw.